Synopsis: Business men are disappearing, and an evil organization called Sigma is responsible. Only Karate-Robo Zaborgar can save the day! Ridiculous fun. That's the best description I can give to KARATE-ROBO ZABORGAR. It's absolutely insane with horrible dialogue, a cliche story, the worse bad guy ever, and women in two-piece fighting gear with rockets coming out of, um, various places. However, like my generations undying love for The Power Rangers, there was something just plain fun about watching this movie. The story is broken into two segments, one as our hero Daimon as a young man then later as an adult. There's an evil organization, Sigma, that is kidnapping wealthy businessmen for their DNA to help create a giant evil robot to take over the world, I guess. Daimon has a motorcycle that transforms into Karate-Robo Zaborgar at his command. Together they try to stop Sigma and their league of cyborgs. Part two picks up 25 years later where Sigma is still at large and still haven't finished their robot. So, this bad guy has spent over 25 years building this weapon. Not economically efficient at all. The story is pure cheese; however, the corny dialogue, which may or may not have lost some of its weight by being translated, makes this a very laughable and fun ride. The first half flies by with the zany dialogue, including a back story about the new element discovered that creates robots, and fun action sequences. Again, a lot of this first half reminded me of The Power Rangers TV show with it's predictability, cliches, and characters. Plus, how come when it's the hero against ten bad guys, the bad guys ALWAYS wait to battle him one at a time? It's ten versus one; should be an easy win! But I digress. The second half lags the fun of the first half. The story evolves, or devolves, into more outrageousness, and a lot of the same gags are played again, but this time have worn out their welcome. However tired it may seem, the movie never loses its playfulness. The acting is very melodramatic but bides well with the silliness onscreen. 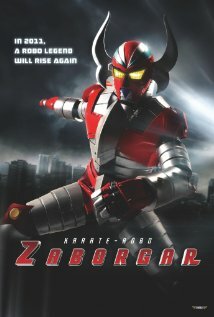 KARATE-ROBO ZABORGAR falls into the ranks of "good" bad movies. You know the types: SNAKES ON A PLANE, TROLL 2, and STEP-UP 2: THE STREETS. It's specific taste that appreciates and genuinely enjoys these types of movies. If you don't, then bypass this. If you do, then prepare to add this to your friend-night movie checklist.